Deep dish pizza. The Philly cheesesteak. The Cuban sandwich. These are iconic dishes that have represented their respective cities for decades. They are also hardly recognizable compared to the totally insane remixes that have come in their wake. We looked to some of the country’s greatest cities to see how they’re improving and outdoing their signature dishes. And man, you’ll need a bib if you’re gonna embark on this road trip. There’s barely anything more southern than the combination of tender pork and decadent bread pudding -- and no one knows that better than Charleston’s The Macintosh. Since it was introduced to the menu in 2011, brunch patrons can’t seem to get enough of this Lowcountry reinterpretation of eggs Benedict, brought to you by the appropriately named executive chef Jeremiah Bacon. 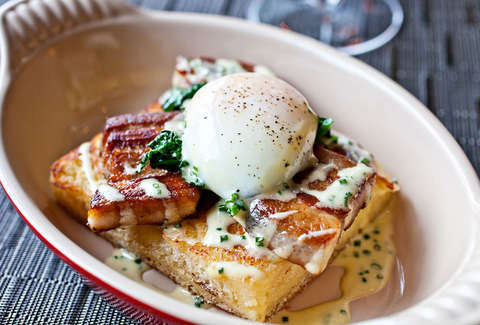 On top of a thick piece of bone marrow bread pudding (brioche soaked in veal marrow, egg yolk, and cream, then seared like French toast) lay three pieces of pork belly, poached eggs, and wilted greens. And no eggs Benedict -- not even Bacon’s -- is complete without the Hollandaise (house-made, obviously). Don’t leave New York before driving six hours north to Rochester, where the signature dish is the definition of indulgent. Garbage plates are the pride of this upstate city, but trust us, they’re a lot more appetizing than they sound. Though the name wasn’t trademarked until 1992, Nick Tahou Hots has been serving up these heaping piles of goodness for over 50 years. When it opened in 1918, the menu included a one-plate meal that consisted of basically everything the kitchen cooked. It wasn’t until much later when some college students supposedly came in asking for a dish with “all the garbage” on it that Nick Tahou himself put a name to the modern delicacy. A favorite of today’s crowd is the Cheeseburger Garbage Plate -- some assembly required. The first half the plate is piled with home fries. The other half gets macaroni salad. Toss on a cheeseburger, the signature “hot” sauce (which is actually just a combination of zesty spices and ground beef), some minced onions, seasoning, ketchup if you please -- and really, anything you want. That’s the point. This Midwestern classic was originated by budget-minded farmwives in the 1930s as a way to feed entire families while pinching pennies. The casserole typically consists of canned veggies, creamed soup, some kind of meat, and tater tots (for crunch and starch), but Minneapolis restaurants have been serving up new takes on the original for nearly 90 years. What was once a cupboard-cleaning comfort food is now the pride of this city. But the cans have been long forgotten. Instead, your hotdish at The Mason Jar will be assembled, cooked, and then served to you in an individual skillet (which it’s practically spilling out of). 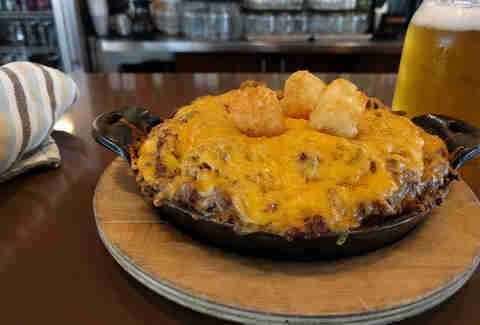 The ingredients: ground beef, housemade cream of mushroom, tater tots, all topped with melted cheddar (because everything’s better with melted cheese). There’s a new favorite dish in your life, and it’s the hotdish. While it’s widely disputed who first created DC’s iconic half-smoke, Weenie Beenie -- the food stand where locals still hungrily gather for the delicacy -- says it’s the true originator. Modern takes on this sausage (not unlike a hot dog, though way bigger and spicier) can certainly be all beef or all pork, but the combination of the two is said to be an etymology of the name. The cooking method (smoked until it’s cooked halfway then finished on the grill) is also a possible explanation. But let’s get down to what really matters: what makes this thing so good. At WB’s, you’ve gotta get your half-smoke fully loaded. That means chili, mustard, relish, and onions. Top it off with an egg and you can’t fail. Texas’s capital city is so closely associated with barbecue (the five-hour wait at Franklin’s is said to be well worth it) that people forget the town’s got other claims to culinary fame. Namely, Frito freakin’ pie. Anything that turns chips into a meal is fine by us, so Frito pie -- which Texans say Daisy Doolin invented in the 1930s -- is A-OK. The mother of Fritos creator Charles Elmer Doolin came up with the idea to top the corn chips with chili, shredded cheese, and chopped onions, and others have been trying to top her creation ever since. Behold, Ranch 616’s Frito Pie Burger: Building from the bottom, it’s an 8oz Texas Black Angus beef patty topped with Fritos, chili, jack cheddar, pico de gallo, and tomatillo crema. And this place doesn’t mess around; their Frito pie (which festival-goers usually eat right off the bag itself) includes beef, pork, black beans, and venison. Tourists flock to this chain for good reason: Gino’s East, which opened in 1966, is one of the first purveyors of Chicago’s famous deep-dish pizza. Baked in cast iron pans, these pies -- complete with a secret dough recipe, a layer of thick cheese followed by sauce on top -- cook for nearly an hour before arriving at the table still too hot to eat just then. (But hey, no harm in creating a little pizza envy amongst your Instagram followers while it cools off.) Now, vegetarians, cover your eyes. The Meaty Legend is topped with “pounds of pepperoni, special-recipe Italian sausage, Canadian bacon, and crispy bacon” and is what dreams are made of. You’ll need a fork and knife... and probably a bib for this one. While it’s now a signature dish in both South Carolina and Georgia, it wasn’t until the 1980s that shrimp & grits gained popularity (and notoriety) when upscale restaurants like Crook’s Corner (Chapel Hill, NC) and Commander’s Palace (New Orleans, LA) put it on their menus. Since then it’s been constant competition: Who can make their shrimp & grits the smoothest? Creamiest? The most extravagant and inventive? Ah, a cheesesteak! How Philly. Except this isn’t any ordinary cheesesteak. With a price tag of $120, it’s the most expensive cheesesteak in the city. A tribute to his hometown’s signature dish, James Beard-winning restaurateur Stephen Starr elevated a classic. 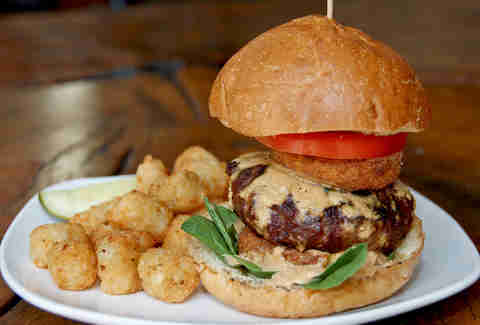 The Barclay Prime sandwich features Wagyu ribeye, foie gras, and truffled cheese whiz on a fresh baked sesame roll. Not fancy enough? Think again. It’s served with a half-bottle of champagne. We love the original just as much as anyone, but this beats a food stand meal any day. The story of the Cuban sandwich is as simple as the dish itself is tasty. When the tobacco industry moved to Florida in the mid-1800s, factory workers needed an affordable lunch option. In Cuba, it was just a sandwich, but to differentiate from other enclaves in Miami and Tampa, the community put their name on it -- literally. And sure, you can get a great Cuban sandwich (which at its most basic is just ham, roasted pork, Swiss cheese, and mustard) tons of places in Miami. But at Sarussi Subs, Sarussi’s Original takes things to another level. While a regular Cubano’s typically six inches long and an inch high, the Sarussi Original is a whopping 16 inches long. That’s two and a half pounds of baked ham, roast pork, and smothered pickles topped in melted cheese and their famous secret sauce (a combination of vinegar, garlic, and spices). For an extra kick, the bread is brushed with garlic butter. Something tells us this isn’t how they were made in the 19th century. Ask any local what the must-try Cleveland dish is, and the answer is obvious: A Polish Boy. Though the name might suggest it, this isn’t a recipe brought over by immigrants or concocted by someone’s grandmother. It’s simply the product of experimentation gone right. As the story goes, Virgil Whitmore, who opened Whitmore’s Bar-B-Q in the 1940s, was trying to find new and creative ways to use the ingredients in his kitchen. With kielbasa, coleslaw, French fries, and his famous barbecue sauce, he created a sandwich that restaurants all over town would soon start replicating. But this thing is messy. Like, really messy. So at Seti’s Polish Boys they took their original and flipped it on its axis. Their C-Town Fries feature all the best parts of a Polish Boy (plus melted cheese, because duh), but in a slightly-easier-to-eat fashion. Serving up the classic sandwich on top of a bed of fries allows for maximum face shoveling, and not a morsel of the signature Cleveland dish wasted. No city defines itself by a food quite like Baltimore does. With the surrounding Chesapeake Bay nearly overflowing with blue crab (the Maryland Department of Natural Resources reported nearly 550 million of them swimming around in 2016 -- a 35 percent increase from the year prior), that’s something to take pride in. And sure, it might seem hard to take this already decadent meat and turn it into something even more impressive -- but that’s exactly what they do at Locust Point Steamers. And that’s exactly what crab fluff is: A fried crab cake that’s dipped in funnel-cake like batter then fried again 'til it’s golden brown. Served with mustard and crackers, this twice-fried beauty is a favorite around town. It should come as no surprise that this Tennessee town barbecues everything it can get its hands on -- yes, even pasta. (Your nonna is probably swearing in Italian, but we promise it caught on for good reason.) Don’t worry, they don’t smoke the noodles themselves or toss them on the grill. Instead, the brainchild of Brady Vincent, a former railroad cook who opened Brady and Lil’s (which became The Bar-B-Q Shop when new owners took over in the 1980s), is made by mixing the spaghetti with a thick, rich base. The recipe is tightly-guarded (and other dives like Interstate Bar-B-Q make their versions), but what we do know is this: The tangy base is pit-smoked for 12 long hours before deemed ready -- meaning before the pork shreds are crazy tender and infused with all that smoky Memphis flavor. If there’s one thing Wisconsin does better than anyone else, it’s cheese. (It is the leading producer in the U.S., after all. In 2016, the state produced over 3 billion pounds of the stuff.) So naturally, chefs everywhere are creating intense dishes that would make the lactose intolerant run for the hills -- like the Veal + Onion Gravy Poutine at Milwaukee’s The Vanguard. And so it begins with a bed of crispy fries. Add in the fried cheese curds and maple-syrup braised duck (because why not?) and top it with the titular veal-onion gravy. If this is bar food in the Midwest, we’ve found our new watering hole. In 2016, it was estimated that Portland had a whopping 800 operating food carts across town -- but it wasn’t always that way. Oregon’s largest city saw a surge in 2008 due to the struggling economy and the flexible zoning laws that made it all possible. While you can get everything from pizza to on-the-go ramen, we found one breakfast sandwich to end all breakfast sandwiches. If you can’t decide between those classic early-morning items (french toast versus eggs, sweet versus savory) The Egg Carton in Portland’s Foster-Powell neighborhood has got your back. Behold, The FoPo Cristo. 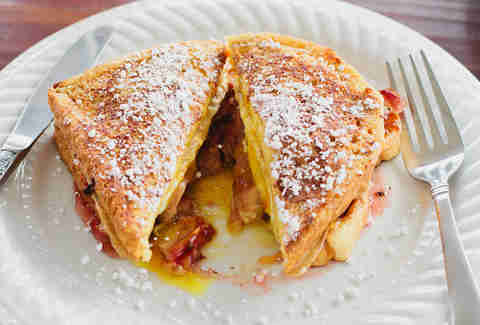 Positioned between two slices of French toast is an over easy egg, bacon, Canadian bacon, Portland-famous Tillamook cheddar, sweet mustard, spicy mustard, and strawberry jam. You’ll never get breakfast FOMO again if you order this bad boy. You can’t go far in St. Louis without finding toasted ravioli on a menu -- especially in the predominantly Italian neighborhood The Hill. Breaded, deep-fried, and often referred to as “meat pillows” (uh, yes please), these savory bites were actually created by mistake. It’s believed that the birthplace is a restaurant called Oldani’s, where at some point between 1930 and 1950, one of the cooks went to prepare a batch of ravioli and dropped them in oil instead of boiling water. But since everything’s better deep fried, these little guys became beloved all around town. The Sliced Pint isn’t just serving them up on their own though. You can take any one of their pies and put a “T-Rav” crust on it. That means while The Meat Puppets pizza topped with pepperoni, sausage, bacon, and hamburger looks like it has a regular crust, there’s actually a secret serving of EXTRA MEAT. T-Rav, baby. The St. Louis way. Turtle soup had always been an upscale delicacy in the U.S. (It’s said that two days after voting for independence on July 4, 1776, John Adams celebrated with a big ol’ bowl of the stuff.) But at some point, we simply overdid it. Canned options became available in the 1920s and chefs tired of breaking down the complex animals. America, for the most part, just got sick of the soup. Except in Louisiana, where the famed Commander’s Palace (open since 1880) stayed true to the turtle (they still serve it). Since the slow-moving reptile can be found in abundance in the state’s swamps, the dish had staying power. Chefs have been modernizing the classic for well over a century -- including James Beard winner and Top Chef contestant Justin Devillier. Traditionally made with beef stock and served with a hard-boiled egg, the executive chef of La Petite Grocery’s take on the dish is even more plentiful. From his New Orleans kitchen, he serves up Turtle Bolognese. The thick meat-based sauce is served over bucatini and finished with sherry, parsley, and a deep-fried soft-boiled egg. Though a popular delicacy worldwide, Dungeness crabs are actually native to the West Coast (they’re named after the port of Dungeness, WA) -- and San Francisco chefs know how to take proper care of their brethren. Praised for their sweet, tender flesh, the total weight of this crustacean is about one-quarter meat. Take it apart and it can be a mouth-watering crab cake, a dip, or a smooth and creamy bisque. But why ruin a good thing? asks R&G Lounge. So they serve you every little bit of it. This made-to-order Dungeness crab is first butchered, then lightly-battered and sprinkled with a salt and pepper sauce before arriving at your table. Anthony Bourdain notes it’s bigger than your head and intimidating to break down... but totally worth it. Few restaurants are as quintessential New York as Serendipity 3. Founded in 1954, this Upper East Side eatery’s over-the-top desserts and ornate interior design quickly began drawing huge crowds. In 2001, it reached national fame when it appeared in the romantic comedy of the same-ish name, Serendipity, starring John Cusack and Kate Beckinsale. 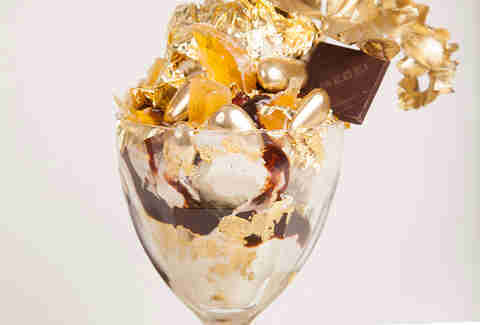 While everything on the menu is already pretty intense (from frozen hot chocolates the size of your head to banana splits that could make your pants split), the restaurant outdid itself for its 50th anniversary in 2004, introducing the $1,000 Golden Opulence Sundae. Later listed by Guinness World Records as the most expensive sundae in the world, this monstrosity requires a 48-hour advance reservation in order for its flashy ingredients to be gathered. Here’s what they round up during those two days. Start with three scoops of Tahitian vanilla ice cream further infused with Madagascar vanilla beans. These, they coat with 23k gold leaf. But whatever will we drizzle? Amedei Porcelana, naturally, the world's most expensive chocolate: derived from a strain of Criollo cocoa bean that hails back to colonial times. Is that enough chocolate? Hell no, that is not enough chocolate; add some ultra-rare Chuao chocolate to double dose this sundae's Venezuelan chocoliciousness. Now add more gold! Gold dragets add some crunch. But wait! More chocolate to balance it out! Chocolate truffles take the stage. Sprinkle with exotic fruits candied in Paris, because ya gotta have those. Better balance some Grand Passion caviar in a bowl on there, too, so the world learns of the existence of salt-free caviar infused with passion fruit and Armagnac liqueur. Top that with a gilded sugar flower; it's not gold enough until Louis XIV would be satisfied. Now use a tiny mother-of-pearl spoon so that the caviar doesn't react with the main sundae spoon. Just kidding; the main sundae spoon is non-reactive, 18k gold. But if the people making this say to use two spoons, follow their instructions. You don't want to be the gauche cad who ruined the grand-sundae eating experience. Just admire the Baccarat Harcourt crystal goblet as you let the experience of this unrivaled joy melt over you. If someone buys you this on a first date, marry them.